Okay, uncambered smoothing plane. You got my attention. Okay, so I had 30 minutes to work on the TSDC desk organizer build challenge. I figured the first step is to prep my stock – plane, then sand if necessary. I’m hot and grumpy. It’s like 85 to 90 degrees outside, like always, and I don’t have any fan in the shop. But my Stanley #4 seems to be doing its job pretty well. At least, until I ran my hand over the board. So I guess I’m going to work on cambering my blade before doing anything else. Either that or go over this board with the cabinet scraper. But with more wood to prep, I may as well take the time to do this right. Right? From what I see in the picture, the edge marks are always from the same edge, not both. If that’s the case, very subtle adjustment of the lateral lever may be all you need. There’s rarely a need to camber a #4. Knock off the sharp corners, but don’t camber it. 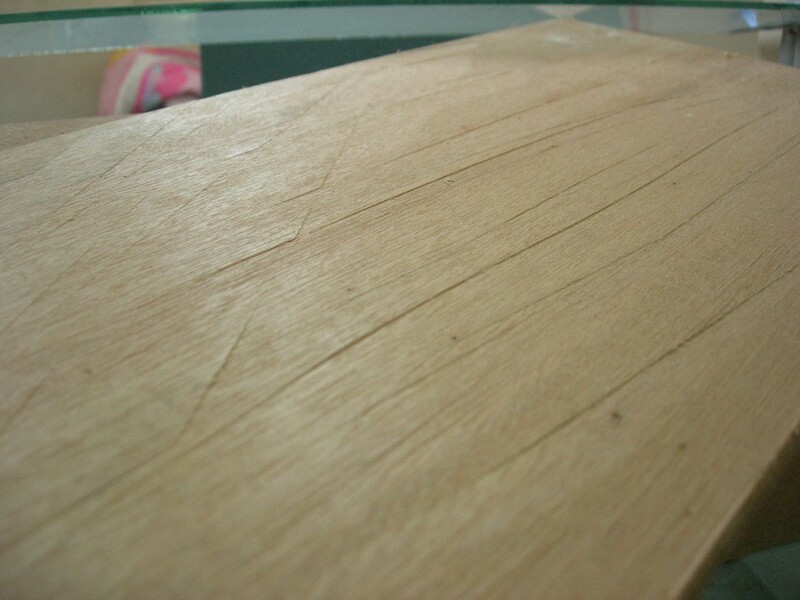 A smoothing plane is for smoothing, and part of that is keeping things flat. You can’t have flat with a cambered blade. Leave the cambering for the roughing plane, the #5 or #6.
out there from whom I can learn. my weakest link right now. stone with some extra pressure on the corners? just need to straighten my blade! While I would tend to bow to Bob’s experience, I think that you can find a nice middle ground. On the last few strokes when honing with your jig, just put a little extra pressure on each of the outside edges. This should result in a “camber” that is hardly noticeable, leave 99.9% of the blade flat, and still knock off the corners that are causing those ridges. I recommend this because I, also, am still in the learning phase with the handplaning, and it gives me enough wiggle room in the plane setup for me to keep working on the mechanics of planing, while still getting reasonable results. I look forward to seeing what you come up with for the organizer. Looking at the photo I have to agree with the comments above, the problem is either the lateral adjustment of the blade or the blade itself is not totally flat. I probably have one of the corners digging more that the other. Also check that the plane sole is completely flat. It’s easy to hit a nail, a metal bench dog or other metal part and get a nick on the sole that will leave tracks on the board, run the plane on some sandpaper on a flat surface to flatten the sole. Also, it the wood is soft like pine, and you have a piece of wood stuck between the blade and the frog (just behind the cutting edge), that can leave some nasty tracks on the boards you’re smoothing. Sorry for missing a question and not getting back. I knocked the sharp corners off my smoother blade by swiping the corners a couple of times with an Arkansas stone (use a medium India stone, or even 220 grit sandpaper). I hit it at a 45 degree angle to the corner. That blunted them enough to stop tearing. I also take a couple of extra honing swipes with finger pressure directly on each corner, in effect making an imperceptible camber.